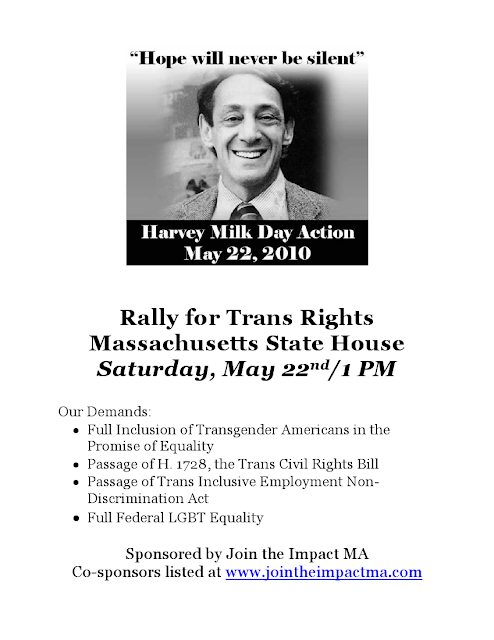 BOSTON SOCIALISM: Harvey Milk Day rally for LGBT rights, May 22! Harvey Milk Day rally for LGBT rights, May 22! Gather with Join the Impact MA and our co-sponsors as we honor the life and work of San Francisco City Supervisor and gay rights pioneer Harvey Milk, on what would have been his 80th birthday, and the first public holiday celebrated in his honor in the State of California. The event is part of a series of activities nationwide coordinated by Equality Across America, and the culmination of the Harvey Milk Week of Action. The focus of the Harvey Milk Day Rally will be a cause Harvey would have championed were he still alive: the inclusion of the transgender community in the promise of full equality which is every American’s birthday. In view of legislative inaction on H. 1728, the trans civil rights bill, the LGBT community must unite to reinforce its determination to pass the bill needed to make trans citizens equal before the law.